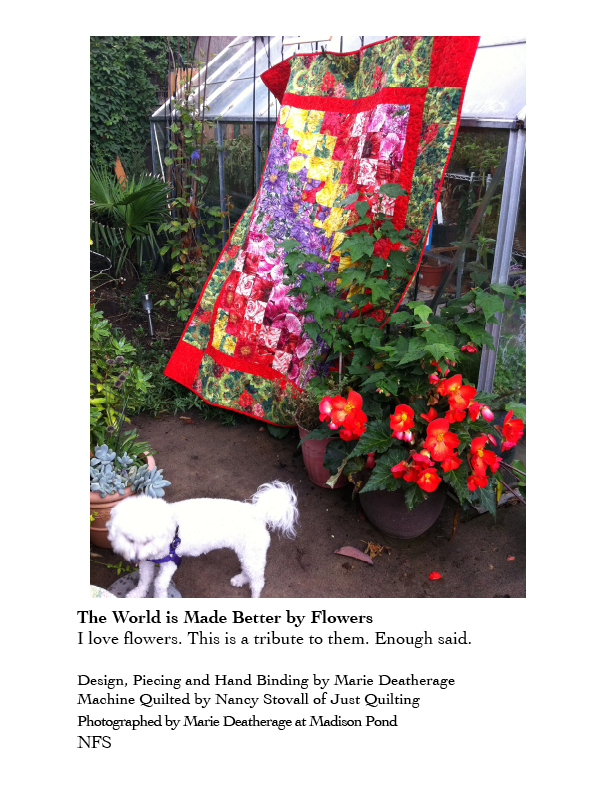 This is the first book review I’ve done about a quilt book. It may be the first book review I’ve done about any book. I really don’t remember. Just please note this is an extraordinary circumstance. And it came about because when I commented on an announcement of the book on Facebook, the book’s author asked me to let him know what I thought. So when I heard he was doing a book about Modern Quilting I knew I had to read it. Here’s the thing: I think this is the first quilt book I’ve actually read like a book. I mean I own plenty of them, but now I realize I don’t read them, I use them. As one uses recipes from a cookbook. I look at the patterns and figure out which ones I want to make and read the instructions to see if I am patient enough to follow them. Then the real fun begins: what fabrics to choose, how to make it my own. I read a paragraph or page here and there to help with a particular task. There are some I plan to read like a book, even start at the beginning, but soon I find myself paging through to see what the author’s approach looks like… to look at the quilts, searching for inspiration. If it’s a Kaffe Fassett book, I look at them again and again, trying to discern what makes his fabrics and quilts so appealing, why they make me so happy. But even that isn’t like reading a book, it’s more like devouring it with my eyes. But Thomas’s book is different. First, it must be said that he is just effing brilliant. I don’t say that often. Hardly ever, in fact. It’s not just that he knows so much about art history and quilt history and puts them in a cultural context. He also thinks about what it all means. And his quilts so simply and beautifully illustrate his insights into those meanings. 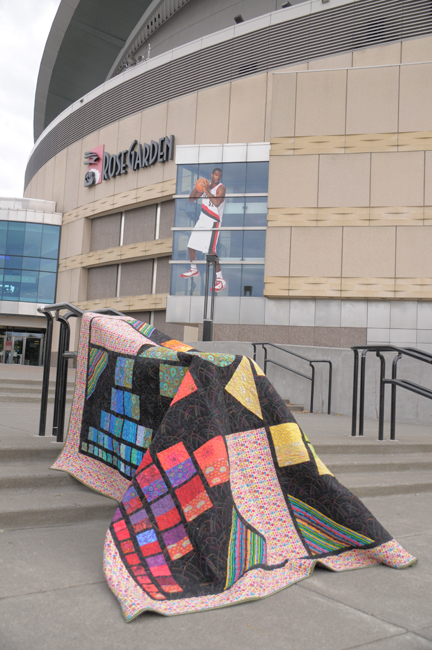 Each quilt is accompanied by a short and accessible story or essay explaining how it came about and why it matters. For example, how quilting and community are connected. The role of individuals in a healthy society. What identity means. How babies are made. Social commentary and political expression. My favorite might be In Defense of Handmade, which uses the bar code of a mass produced quilt as the pattern. How freaking brilliant is that?!? 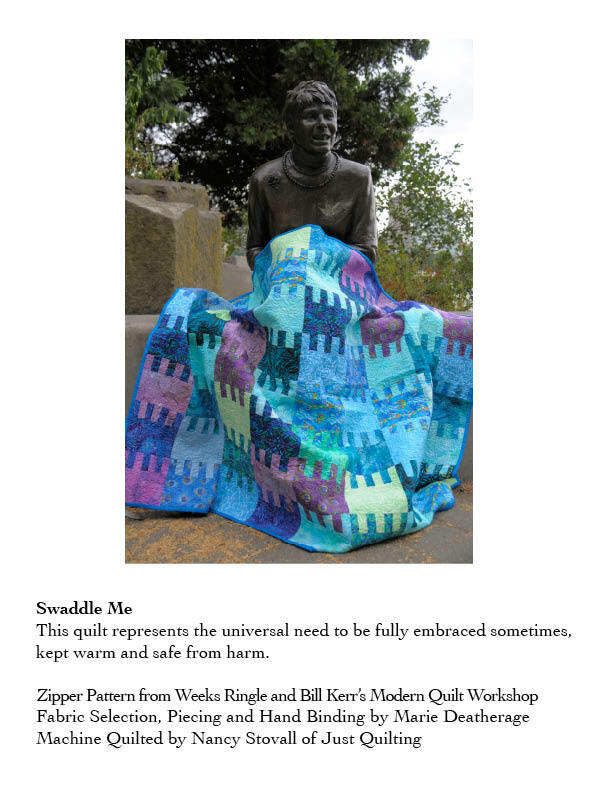 The quilt could serve as the poster child and its essay the manifesto of the maker movement. At the same time, the book is filled with little gems in boxes…like about using tonal fabrics, aiming for randomness. How to get beyond symmetry. And techniques for achieving quilts I had never imagined, like joining four small quilts into a larger whole with loops and buttons. He’s also so very observant, of very big and very little things. For example, one of the quilts in the book is made of multiples of the letter H, because when he and his daughter were walking in the sun holding hands, she pointed out that their shadow was an H. The fact that he was attending to her, noticing what she said, being so inspired by it that he designed a quilt and then included her in the making of the quilt shows her that her ideas matter. She matters. Imagine our world if every child grew up with that. When I see and hear this story, the letter H also becomes Hope for Humanity. Most of all, Thomas encourages readers to use his book as a point of departure in their own quilting journey. It explained a lot of things that made my own progression make more sense and why I’m at a kind of crossroads now. I don’t think I would know I am here if I hadn’t read his book. When I first started quilting, I was learning techniques. Enough to follow very simple patterns. I even made one from a kit! I picked fabrics I liked but didn’t know to pay attention to how the fabrics worked with the pattern, or not. Often not in my case. Once I felt comfortable enough with technique, I focused on fabrics with gorgeous saturated colors, then looked for a pattern that would let it glow. At this point I just wanted to make quilts that were beautiful. Something to eat with my eyes. But then that was no longer enough. One day I made blocks with colors I thought looked great together and were “on trend” but looking at the top laid out on my design wall I was overcome with a feeling of utter boredom. I mean, the colors were pleasing and all, but just. so. boring. 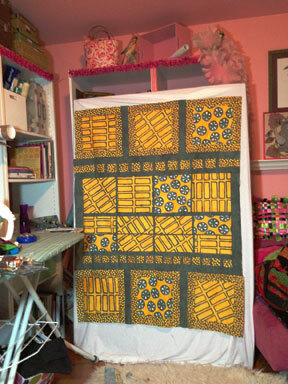 My next quilt was one I designed to convey differences among settlement patterns. Drawing from my academic background studying geography, I tried to take the concept of differences between gated communities of large private estates and inner cities that are crowded and chaotic and illustrate the different feelings they evoke. That when settlements have too much order and privacy they can lose serendipity and liveliness. And why I would rather set myself up for unexpected discoveries and unforeseen moments even when it means giving up security and control and comfort. I used a print collection by Malka Dubrawsky (from moda) to help make this point but after reading Modern Quilt Perspectives, I have enough confidence to try expressing myself relying less on the fabric and more on my own design. 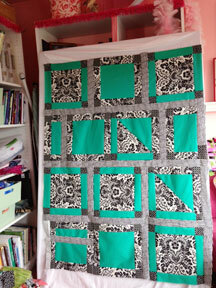 While I will still make quilts because they are beautiful (especially as long as there is a Kaffe Fassett Collective! ), now I know that I will seek more meaning whenever I start cutting fabric for my next quilt. Yes, I’m aware that this book review has turned into an examination of my own quilt journey, but it feels like that’s the way Thomas Knauer would want it. And that’s why his book matters so much. And why you should read it. The idea and general design for this quilt came to me in a dream. Seriously. Fortunately, I remembered it when i woke up. For once. And then Blaine helped me with the important details. Like what the brackets are all about, what seed plays what seed in the first round, etc. etc. Basically, it tells the story of an entire March Madness tournament, from the first round to the championship game. And has fans in the bleachers and watching on tv. It was really hard to get everything right. 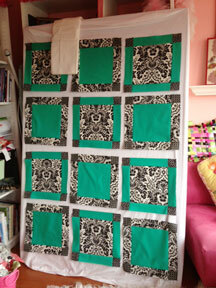 In fact, I’d have to say it was probably the most difficult quilt I’ve made to this point. I had to figure out the pattern and how to make it all fit, and of course rip out and resew it in quite a few places. It’s called Cinderella Story because the lowest ranked team in the weakest bracket ends up taking it all. 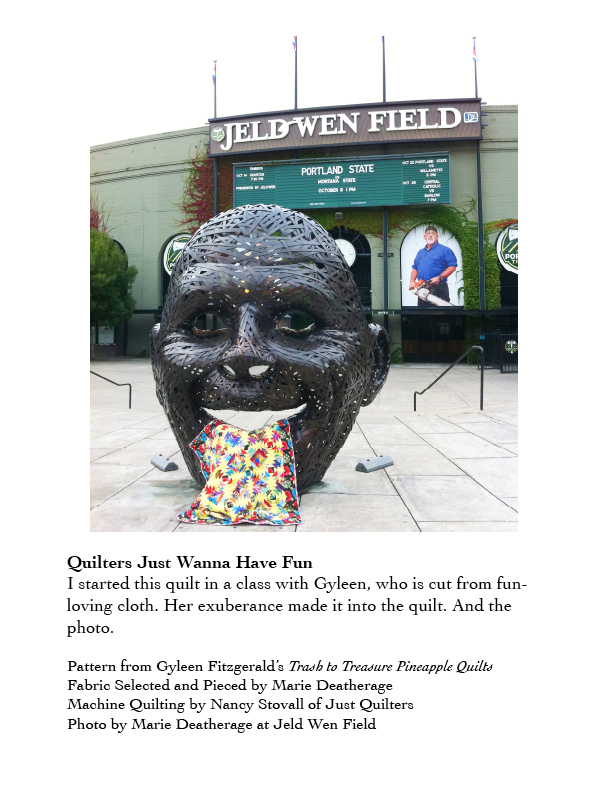 You can follow the story in the quilt pattern. 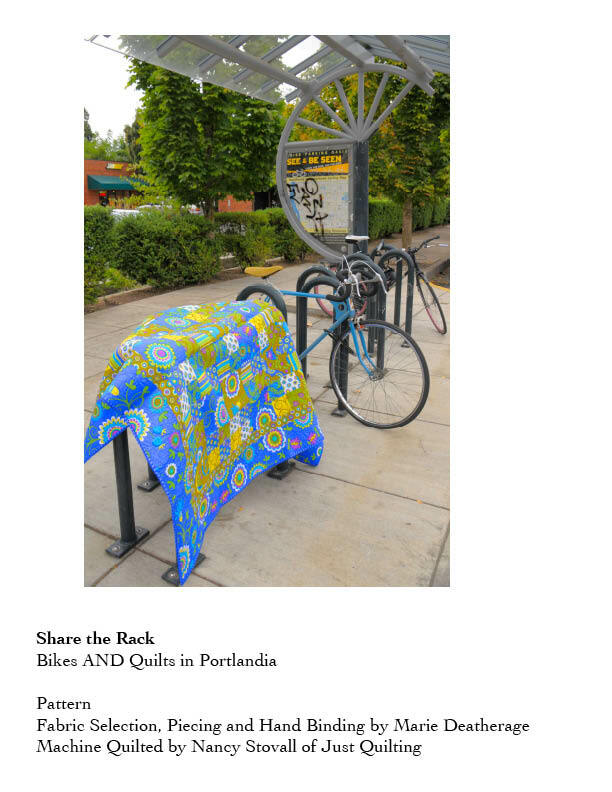 It’a a really big quilt, so I couldn’t really figure out where to hang it to get the whole thing in one frame, but I did include it in the adventure Joyce and I undertook to depict my quilts in iconic Portland locations. Maybe there’s enough showing to give you the general idea. Ric and Blaine are at the Rose Garden at this very moment watching the second round game of the 2012 NCAA tournament between Indiana and New Mexico! But I’d like to point out that in this year’s tourney, there were two near-Cinderella stories in the first round, with two #15 seeds knocking off #2 seeds. So maybe there will be a Cinderella story for my quilt. Maybe, just maybe, despite the odds and NCAA rules, someday my Cinderella will be invited to the Big Dance. The name, of course, is a play on Share the Road, a bumper sticker frequently on display in Portlandia, where bikes pretty much rule. There is a sorta interesting backstory about this bike shelter. The Hawthorne Bridge was closed for repairs for a seriously lllloooooonnnnnngggggg time a few years ago, seems to me it was closed for a year and a half or maybe even two years. Soon after we got our bridge back, however, a movie crew took it over for a few months to film a number of scenes from the movie The Hunted. 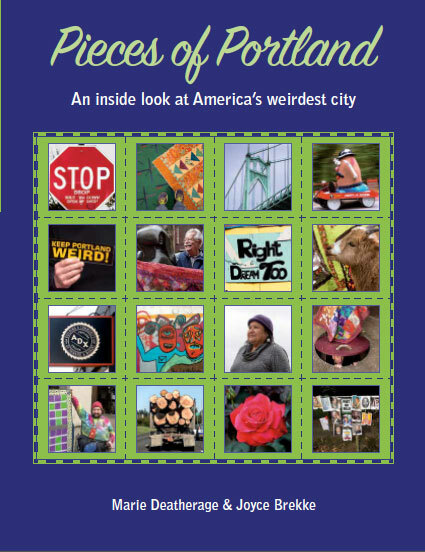 Our patience had worn very thin so there were a number of complaints from the Portland citizenry. To placate the public, the movie company promised to build a covered bike shelter on Hawthorne Blvd. as a kind of “thank you” gift. This is that very bike rack. I used several prints from the periwinkle blue and green Pretty Bird fabric from Michael Miller. I think this would look especially fine on a tweenager’s bed.